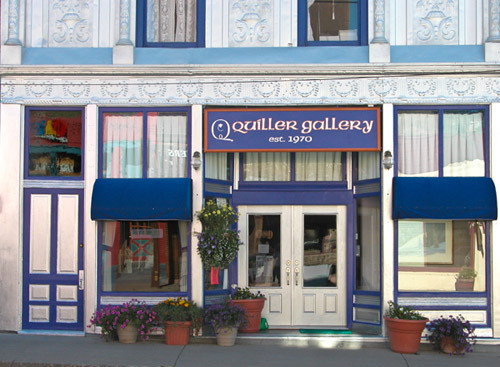 The Quiller Gallery is open throughout Summer and Fall and by appointment in Winter and Spring. We feature a number of talented artists in the Gallery, in addition to Stephen Quiller. See images and bios below. For more information about the gallery artists' works, please call us at 719-658-2741. Gail Frasier has been making one-of-a-kind sculptural vessels since 2000 with 20 years of functional pottery to her credit before the turn of this century. Natural changes and growth found in minute details of tree bark, worm trails, seed pods and other natural gems are integral to her work. 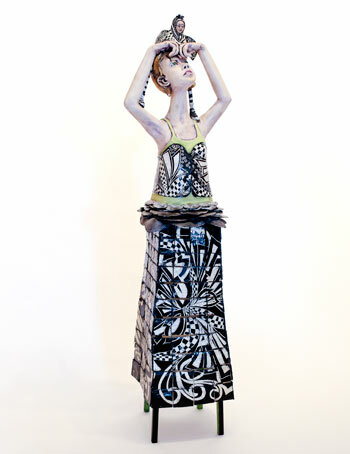 She finds self-expression in clayʼs pliability, its ability to hold textures, and its durability. Frasier was born in Kansas City, Missouri, raised in Lake Wales, Florida, and attended the University of South Florida, where she studied mathematics, design, and pottery. For many years she was a resident and active art community member of Evergreen, Colorado, before moving to Loveland, Colorado in 2014. 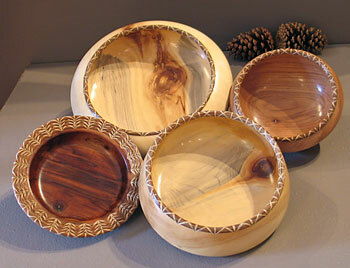 Sam Saunders spent many years as a cabinetmaker and since 2005 has used his creative talents to showcase the beauty that can be found in unique creations resulting in wood bowls and platters. The rough wood for the pieces is cured for up to two years before being turned on a lathe to reveal its hidden beauty. He uses aspen, black willow, sycamore, cherry, and hackberry, and enhances each piece by attaching Southern Long Leaf Pine needles to the edge with fiber from the Raffia Palm in a manner of weaving. Sam studied at the Arrowmount School of the Arts and Crafts in Gatlinburg, Tennessee, as well as the Water Works Studio in Tulsa, Oklahoma. After spending 20 years on the Western Slope of Colorado he makes his home and studio in Tulsa. Jocelyn Russell is an avid outdoor and wildlife enthusiast. From an early age, her frequent family trips to the mountains afforded her the hands-on experiences of nature and kindled her desire to pursue her childhood passion of being an artist. She has flourished in the opportunities of the art world and her dedication to research has taken her to many destinations in the U.S. as well as to Costa Rica, Alaska, and Africa. Russell has attained recognition through multiple exhibitions, honors, awards and publications, including several honors at the NatureWorks Wildlife Art Show of Tulsa, Oklahoma, and the commission for the creation of “Staff Sergeant Reckless” for the National Museum of the Marine Corps in Virginia. 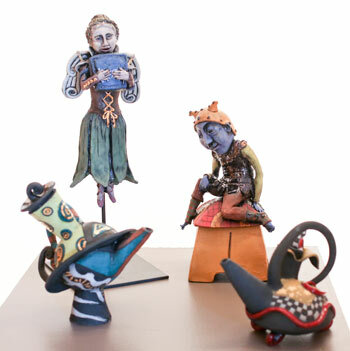 Sharon McCoy describes herself as a “narrative artist,” using clay as her primary medium, incorporating found objects and metal into many of her sculptures. Her works are layered in symbolism, Biblical reference, and underlying sarcasm, often depicting a fanciful flight of escape from daily entrapments. Originally from San Diego, California, McCoy as been a resident in the farming community of Monte Vista, Colorado, since 1980. She received her BA and MA from Adams State University of Alamosa and her MFA at Fort Hay State University, of Kansas. She has been a part of multiple exhibitions, galleries, and publications throughout the United States. Since 2015, John and Allie have collaborated on a variety of artistic endeavors. John is a skilled craftsman and artisan while Allison is a filmmaker who grew up with the visual arts. Their home and studio are in the beautiful mining-turned-art town of Creede, Colorado. They share a love of history and the mountains, and their work often invokes the nostalgia of a certain time and place. Glass Collage is a process in which found objects are arranged on window panes and coated with a clear epoxy resin. These pieces can be hung in front of a window or a few inches from a lighted wall - they cast beautiful shadows and reflective light much like stained glass. Many times the arrangements are in the form of trees or other natural elements while the materials are mechanic, juxtaposing the worlds of nature and man. They are available to do work on commission. Often, clients will ask for personal memorabilia to be incorporated. John and Allie have worked with arrowhead collections, seashells, WWII artifacts, jewelry and much more.